What is dark matter? Why study dwarf spheroidals? Dark matter is curious. There is breathtaking evidence that it exists, but it has never been directly detected. The leading theory is that dark matter is made up of weakly interacting massive particles (WIMPs), which annihilate or decay into Standard Model particles, including gamma rays (The Standard Model of Particle Physics includes a classification scheme for subatomic particles). This is thought to happen in the halos of galaxies. Out of the many possible Standard Model products, gamma rays and neutrinos are two of the most advantageous to search for. Because they are uncharged, they make it to Earth without being bent by magnetic fields and point right back to their source. Dwarf spheroidal galaxies (dSphs) are companion galaxies to the Milky Way. They are low-luminosity objects which have very high mass to light ratios, making them promising candidates for dark matter searches. Their close location to us and location at high Galactic latitudes, where astrophysical foreground are lowest, makes them even more attractive candidates for study. The authors of this paper used data from two very different gamma-ray experiments to study dSphs and look for evidence of dark matter annihilation: MAGIC and Fermi-LAT. When a gamma-ray from outer space hits the Earth’s atmosphere, it interacts with molecules in the air and sets off a multi-particle cascade known as an extensive air shower. If these particles are traveling faster than the phase velocity of light in air, they give off a faint blue light known as Cherenkov light. 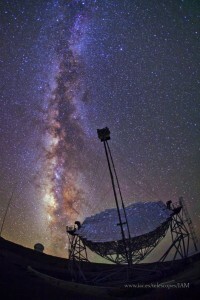 The MAGIC telescopes, located on the Canary Islands of Spain, detect this light. MAGIC can detect byproducts caused by gamma-rays with an energy between ~50 GeV and ~50 TeV. MAGIC has extensively studied the dSph Segue 1; data from this was used in the paper. Fermi-LAT is a satellite telescope that has been orbiting Earth since it was launched in 2008. It is capable of detecting gamma rays directly and complements MAGIC nicely, as it operates at lower energies MAGIC can’t reach (~20 MeV to 300 GeV). It surveys the entire overhead sky every few hours. 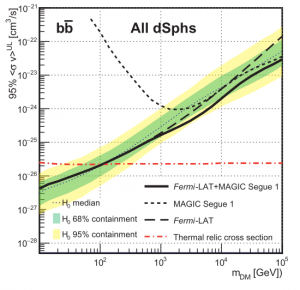 Fermi-LAT observations of 15 different dSphs were used in this analysis. The number of gamma rays coming from an dark matter annihilation inside an astrophysical source depends on two parameters: the gamma-ray flux and the instrument response of the telescopes. The gamma-ray flux further depends on a few more things: the mass of the dark matter particle, the annihilation cross-section, and a factor called the “astrophysical factor” (sometimes just called the J-factor). The limits on the annihilation cross section for one of the decay channels studied. It shows the 95% confidence upper limit for the cross section as a function of the mass of the dark matter particle. It is clear that the limit for the two experiments combined (black solid line) is lower than for either experiment alone (black dotted lines). The yellow and green bands are the 95% and 65% containment for how the limits would be distributed under the null hypothesis. The authors looked for dark matter annihilation coming from dSphs using a likelihood analysis, a standard technique to test a hypothesis against the null hypothesis. Using the data from both telescopes, they computed the likelihood that the observed gamma rays came from dark matter annihilations for a variety of different decay channels and dark matter masses. They didn’t find an evidence for dark matter annihilation coming from dSphs in the data set, so they instead set upper limits on what values the annihilation cross-section could have. The limits on the annihilation cross section from this paper are for dark matter particles with a range of masses between 10 GeV and 100 TeV, making this study the widest mass range ever explored by a single analysis. Because data from two different experiments were combined, the limits are up to a factor of 2 better in some parts of that mass range. The authors also note that the likelihood method they used could be easily extended to include data from other gamma-ray or neutrino experiments, further constraining the limits or even leading to the indirect detection of dark matter!